The last time Jeff Bridges played SLO Brew, elbows were thrown as were stern glances and indignant glares … and those were just from the women protecting their real estate near the stage! I didn’t even attempt to get close enough to get a photo, but a couple gal pals told me their attempts to get nearer the stage were thwarted by women who refused to give up their coveted spots. Well, bust out the elbow pads and the field hockey shin-guards and prepare for Bridges’ return! Just like last time, I expect tickets to go fast, which is why I’m giving you a week’s notice that next Thursday, June 27, Jeff Bridges & The Abiders return for two more intimate shows at 6:15 and 9:15 p.m. (Doors at 5:30 and 8:30 p.m. respectively; 21-and-older; $40 presale or $45 at the door). ABIDING : Actor, musician, and photographer Jeff Bridges and his band The Abiders play two shows at SLO Brew on June 27. Tickets are going fast. Bridges, perhaps best known for his role as Jeffrey Lebowski (aka The Dude) in the Coen Brothers’ 1998 cult classic The Big Lebowski, showed his musical side in 2009’s Oscar-winning drama Crazy Heart, where he played faded country musician and alcoholic Otis “Bad” Blake. But he was hardly new to music. He was trained on piano as a child, and used those skills in the 1989 film The Fabulous Baker Boys with his brother Beau Bridges. It’s also known that while working on the 1980 film Heaven’s Gate, he often played guitar and sang with co-star Kris Kristofferson between takes. In 2000, he released his first album, Be Here Soon, which proved he had the chops to play “Bad” Blake, a character partly based on Kristofferson. Clearly, Bridges is a life-long musician, but since his role as “Bad” Blake, he began concentrating more and more on his music, having built a recording studio next to his garage on his 19-acre mountaintop home that overlooks Montecito, near Santa Barbara. 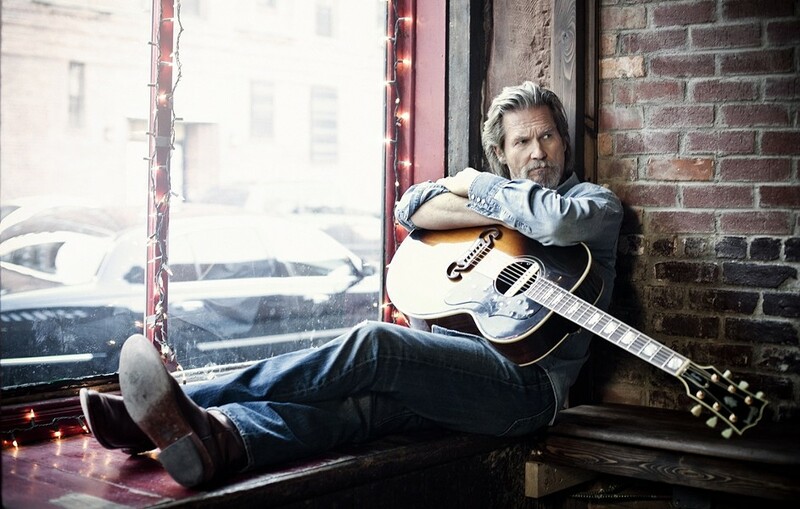 His most recent album, 2011’s Jeff Bridges, which peaked at 2 on Billboard’s Top Folk Albums chart and 5 on its Top Rock Album chart, is a solid piece of work produced by T-Bone Burnett. During his shows, he performs songs from Crazy Heart, select covers, and songs from his two albums. Plus, you get to hang with The Dude! Don’t wait too long or those tickets may be gone. Before next Thursday, SLO Brew has a handful of other shows cooked up for you. For instance, this Thursday, June 20, check out Zavalaz (doors at 8 p.m.; all ages; $15 presale or $20 at the door). Cedric Bixler-Zavala is the Grammy Award-winning front man of the alt-rock act The Mars Volta. Word on the street is Zavala appreciates Frank Zappa and employs eccentric on-stage behavior. This one could get weird. Ring in the summer solstice when reggae and hip-hop act Bare Feet returns to SLO Brew on Friday, June 21 (doors at 7 p.m.; all ages; $8 presale or $10 at the door), with The Young Rapscallions, KauzaFex, and JP The Diesel opening. And if you’re in the mood for some eye candy, SLO Brew hosts a Beach Body Fitness Competition on Saturday, June 22 (doors at 7 p.m.; 21-and-older; $5 at the door). There are both male and female divisions with ten competitors each. Since there’s not a Doughy 50-Something division, I will not be competing this year. The summer solstice is upon us, so don your white robes and let’s sacrifice some virgins! OK, I guess that’s illegal now. How about this instead? There’s a Two-Day Celtic Solstice Festival at Steynberg Gallery. CELTIC SUMMER : The Celtic duo of Hanz Araki & Kathryn Claire will perform on June 20 in Steynberg Gallery on the first night of their two-night summer solstice festival. 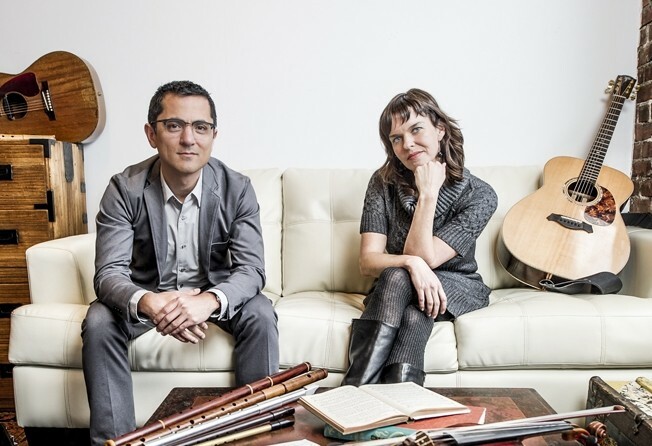 The Celtic duo of Hanz Araki & Kathryn Claire will perform on Thursday, June 20 at 7:30 p.m. ($15) and the Celtic trio of Jeana Leslie & Siobhan Miller with Aaron Jones will perform on Friday, June 21 at 7:30 p.m. ($15). Welcome in summer, Celtic style! If you know someone in Jill Knight & The 805s, One Time Spaceman, Girls & Boys, or Zongo All-Stars—or are enterprising enough to find them online, contact them, and request them—they’ll probably give you free tickets to the soft opening of the Vina Robles Amphitheatre, which will feature all four acts performing this Saturday, June 22 from 6 to 11 p.m.
FIND THESE GUYS! : Zongo All-Stars, as well as three other local acts, are giving away free tickets to their show on June 22, the first performance at the new Vina Roblles Amphitheater. That’s right, the tickets are free! You just need to get a hold of them! Then head up to the new venue, find your seats, and check out what promises to be an extraordinary new place to see live music. Naturally, food and beverages will be available, so bring some dough for that. And since it’s early in the summer, you may want to prepare for a chilly night. See you there! Otter Productions, Inc. and Collective Efforts Events have a great reggae show for you this Sunday, June 23 to ring in summer when Damian “Jr. 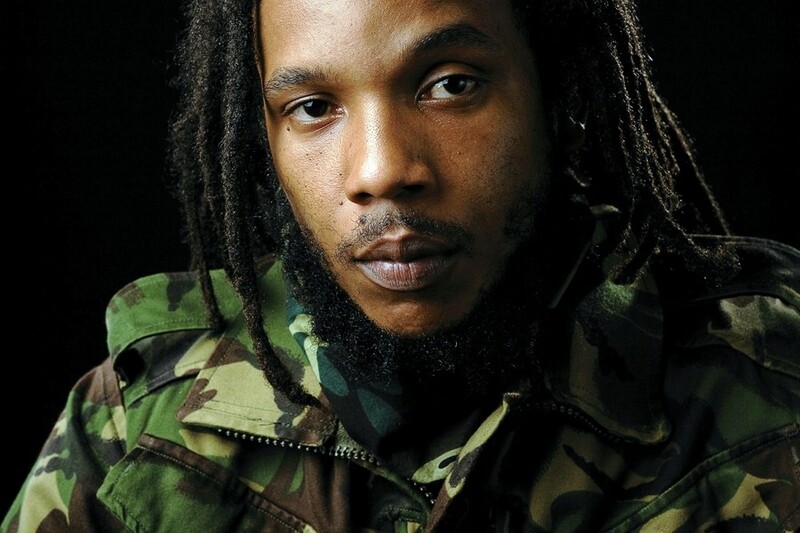 Gong” Marley and Stephen Marley play at 4 p.m. out on the green at Avila Beach Resort. MARLEY! : Stephen Marley and his brother Damian “Jr. Gong” Marley play Avila Beach Resort on June 23. You can see the ocean and smell the sea air all while enjoying music from Bob Marley’s sons (doors open at 2 p.m.; tickets are $35 and available at all Vallitix locations, online, or by calling (888) 825-5484). Don’t miss the socially conscious sounds of the Marley brothers! Lisa Turner headlines a songwriter showcase at Shell Café on Thursday, June 20 (6:30 p.m.; all ages; free). This powerful vocalist has been compared to Melissa Ethridge and Sarah McLachlan. Holly Ann Phillips and Cynthia Hathaway also perform. Fresno-based roots, blues, Americana band Lance Canales & the Flood play Frog and Peach this Thursday, June 20 from 10 p.m. to 1 a.m. The trio from California’s breadbasket “lived the life that so many songs have been written about since the birth of roots music: hard labor, one room shacks, and taunting ghosts whispering of a better life,” according to their bio. “Canales’ guttural vocals combine a hard-edged storytelling approach beneath a stripped down, foot-stomping, acoustic instrumentation.” The trio also features stand-up bassist David Quinday and multi-percussionist Zak Parrish. This Thursday, June 20, Luna Red’s late night music series features Moon Pie playing from 10 p.m. to midnight, and its Sunday afternoon music act this week is Magpie on Sunday, June 23 from 3 to 6 p.m. They’ll have sweet drink deals and food specials. Burning James and the Funky Flames bring their New Orleans-style sounds to Concerts in the Plaza in front of the SLO Mission this Friday, June 21 from 5:30 to 7:30 p.m. The bar and food vendors open at 5, so come early, grab a snack and some beer or wine, and nab a good seat! Fialta is a local indie-pop band featuring two guys and two girls who are releasing their full-length album, Summer Winter, this Friday, June 21 at Kreuzberg (9 p.m.; $15 gets you in, a copy of the album, and a free beer, or get tickets online for $12 plus a $1.65 fee). The Honey Trees open. The two guys—David Provenzano and Mike Leibovich—were both former members of the rock band Sherwood, which formed in San Luis Obispo in 2002, signed to MySpace Records, and toured the world, before disbanding in 2011. Beth Clements and Sarah Shotwell round out the shiny pop act. I check out some songs online, and there’s whistling! These songs are infectious! “We’re going to be featured this Thursday on the Krush 92.5 Lounge Show, and we’re also playing at Roll Out the Barrels at Claiborne and Churchill on Saturday, June 22,” said Mike. Check ’em out! 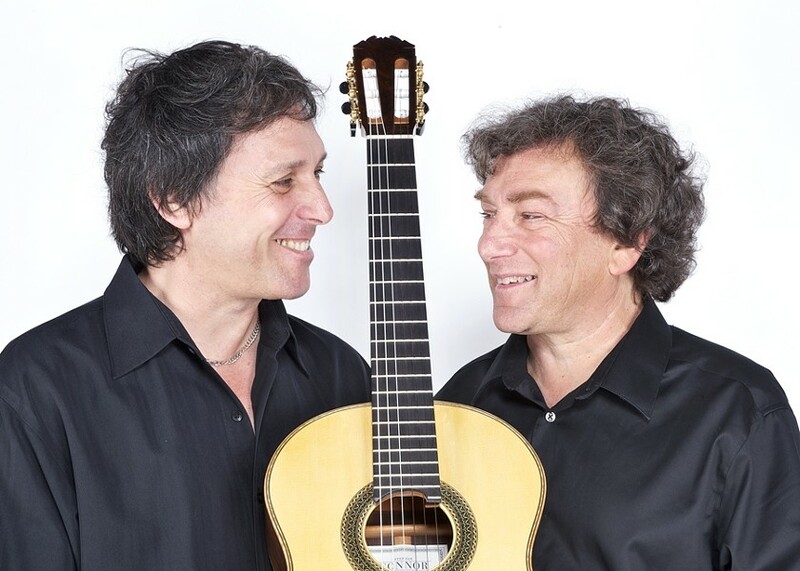 TWO GUITARS : Steel string virtuoso Peppino D'Agostino (left) plays solo at Coalesce Bookstore on June 21 and again with classical guitarist David Tanenbaum (right) on June 22 at Castoro Cellars Winery. SLOfolks has an old favorite returning for two shows this week when steel string virtuoso Peppino D’Agostino plays solo at Coalesce Bookstore (7 p.m.; $22; 772-2880) on Friday, June 21 and then plays again, this time collaborating with classical guitarist David Tanenbaum, on Saturday, June 22 at Castoro Cellars Winery (7 p.m.; $22; 238-0725). The two first performed together in an impromptu setting at the 1998 Schorndorf Guitar Festival in Germany, “finding an immediate affinity toward each other and their audience,” according to press materials. Americana and bluegrass band Doc’s Holiday plays Frog and Peach on Saturday and Sunday, June 22 and 23. The quartet writes songs about their small town lifestyles. Grover Anderson headlines a songwriter showcase at Sculpterra Winery on Sunday, June 23 (1 p.m.; all ages; free). This singing storyteller has a laid-back style and intricate vocals. Guests include Ezra Henderson, CV Wells, and L.A.’s Lisa Turner. The Guy Budd Band is the next act playing the Sizzlin’ Summer Concert Series and Farmers’ Market at Ramona Garden Park from 3 to 6 p.m. on Sunday, June 23. David Ford headlines a songwriter showcase at Bon Temps Creole Café on Monday, June 24 (6:30 p.m.; all ages; free). The British rocker is on a U.S. tour promoting his fourth solo album Charge. Ford’s songs are about self-reflection, anger at the cynicism of contemporary life, an unshakeable belief in the value of romance despite its fallibility. Dulcie Taylor, Kristen Black, Patrick O’Hara, and Aaron Porter will also perform. If you’re hungry for a taste of Mardi Gras, have I got the show for you! 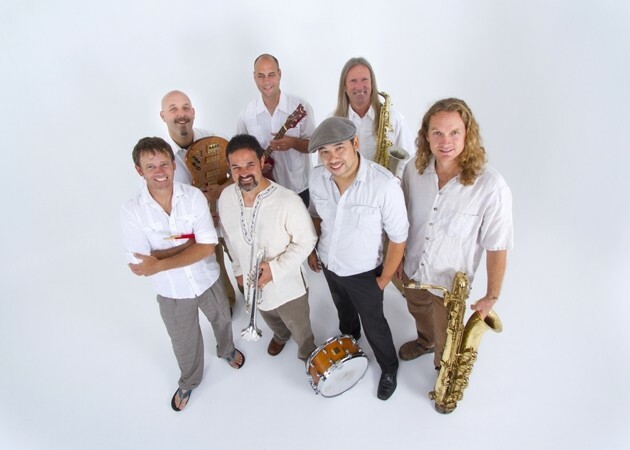 This Tuesday, June 25, head to Bon Temps Creole Café at 8 p.m. to see Fat Tuesday play their “One Tokunaga over the line World Tour.” The iconic ‘80s Santa Barbara band, which features Mark Comstock and David Feldman, breathes in and out the funk vibes of groups like the Meters, Dr. John, Professor Longhair, and Little Feat. David and Mark, along with Casey Jones, were all veterans of Spliff—Santa Barbara’s very first reggae band—and with the addition of bassist Gary Sangenitto, keyboard and blues-harpist Scott Kaufman, and sound man Guy Tokunaga, the Fat Tuesday lineup was set. Their shows from ’80 to ’83 were the stuff of legend and occasional police action! Sure, they went on to real jobs, but now they’re back to play this show to pay homage to Guy, who lost his battle with cancer this February. Donations will be accepted at the door to benefit cancer research.